The U.S. Department of Energy has awarded up to $3 million to the SUNY College of Environmental Science and Forestry (ESF) to develop and demonstrate ways to reduce the cost of delivering woody bioenergy feedstocks to biorefineries. Specifically, the grant will be used to lower the delivered cost of short-rotation woody crops; rapidly, accurately, and reliably assess feedstock quality; and improve harvest and preprocessing operations to produce feedstocks that meet key biorefinery partner specifications. ESF will work with partners including Case New Holland Industrial (CNHi), GreenWood Resources, University of West Virginia, Applied Biorefinery Sciences, Idaho National Lab and others to complete the project. Dr. Timothy Volk, a research scientist who leads the willow project for ESF, said the ultimate goal is to make renewable biomass feedstocks more affordable. "The principal objective of this project is to lower the delivered cost of short-rotation woody crops feedstock by optimizing and demonstrating a commercial-scale supply system," he said. Getting wood chips into the hands of businesses that produce biofuels, bioproducts and bioenergy is a complex process, Volk said. This project will focus on improving existing harvesting technologies and handling, storage and transportation infrastructures. The project will also monitor the quality of the biomass material in the process and come up with recommendations to maintain high quality in the material all along the supply chain. Also, the project will include the evaluation of preconversion techniques and blended feedstocks to meet biorefinery partners' target quality parameters and demand for year-round supply. 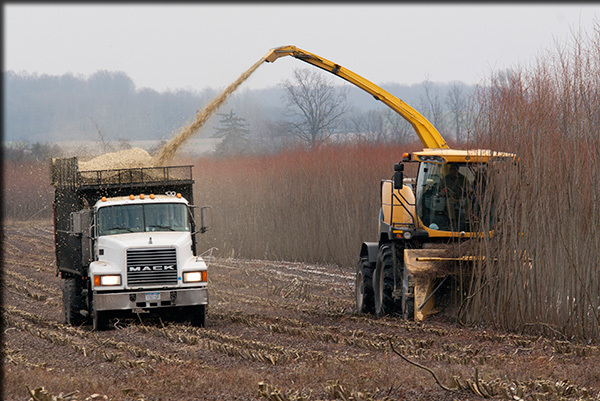 ESF's work with short-rotation woody crops has focused on shrub willow for more than 25 years. Shrub willow produces harvestable biomass at a rate of about four to five dry tons per acre each year. It can be grown on marginal land, thereby stimulating rural development. The crop provides environmental benefits as a renewable energy source that does not increase greenhouse gas emissions. It also reduces soil erosion, mitigates water pollution and provides wildlife habitat. The college is working with Re-Energy Holdings to provide a market for shrub willow that is being produced on about 1,200 acres in northern New York. Re-Energy runs a plant that uses wood chips from biomass to provide renewable electricity to Fort Drum, home to the U.S. Army's 10th Mountain Division. In announcing the grant, the DOE also announced the University of Tennessee will receive up to $3.5 million to study how blending feedstocks could play a role in increasing the amount of available feedstock within a given delivery radius. The project will develop and demonstrate a state-of-the-art biomass processing depot to reduce sources of variation along the supply chain of multiple, high-impact biomass sources (pine and switchgrass) and deliver a consistent feedstock optimized for performance. Bioenergy feedstocks include corn stover, switchgrass, and woody biomass.